This is an early mockup of a ESP32 based adapter for Raspberry PI. I like this early mock-up’s because they give me an idea about what we can get away with. in this case I can add 3-4 connectors top-left to get some extra IO, but I will still have plenty of space. I need to connect and experiment with CAN and UART’s on ESP32 before I finalize this board. But, I do like this form-factor. I can probably also squeeze this down to a smaller format dropping the IO connectors. I added 1 x CAN, 1xRS485 and 1xUART. The later is perfect for HMI etc. 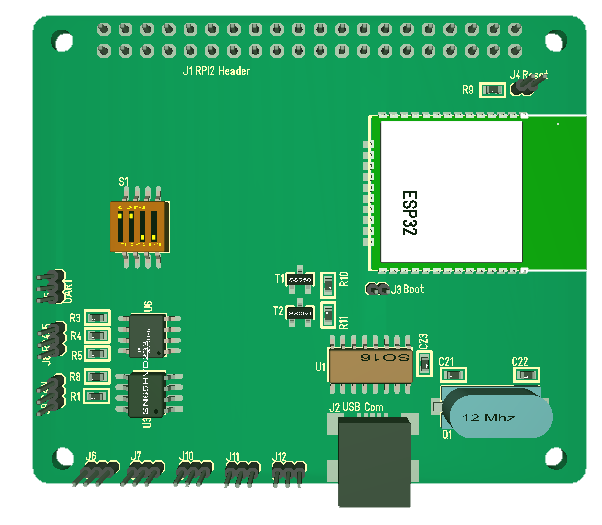 This will as mentioned work as a RPI Hat or stand-alone Wifi connector. The good thing about ESP32 is that it is still a decent, low cost breakout even if you do not use Bluetooth or Wifi.